Dr. Chaudhary is medical director for Seclairer, an organization devoted to the dissemination of evidence-based practices, located in Delmont, Pennsylvania. He is Diplomat of the American Board of Psychiatry & Neurology in General Adult, Addiction, and Geriatric Psychiatry. He has been practicing psychiatry for the past 20 years and has received two years intensive training by Behavioral Tech Research, Inc (Marsha M. Linehan PhD) in learning and implementing Dialectical Behavioral Therapy (DBT). He has spearheaded DBT based treatment programs and trainings at both private and public sector. His experience includes providing extensive training, supervisions and consultation to treatment providers affiliated with large public– sector systems in the implementation of mindfulness based treatments. 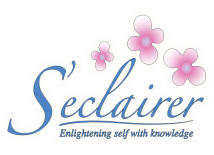 He has initiated the delivery of healthcare in a wellness setting at “S’eclairer” located in Delmont PA. He has organized several CME conferences and has been a guest speaker for Grand Rounds and Faculty Presentations. Dr. Chaudhary had served as associate editor of Bulletin, a periodical for Allegheny County Medical Society serving 3,000 physician members, since 1998 and Medical Editor for this monthly periodical for 6 years. He has been actively involved in various aspects of mental health care including private, public and correctional health sectors. He has actively spearheaded securing grants for drug and alcohol prevention program for youth from Department of Justice to serve the needs of this region. He enjoys music, art, culture, biking, traveling, reading, swimming, nature and listening and learning. "Edges of Mystery: Conflicts and Pakistani Mangos"
"Understanding the Fundamentals of Brain Health and Chronic Diseases"
Dr. Jahangeer is Board Certified in General Psychiatry as well as Child & Adolescent Psychiatry. He completed his residency at Delaware Psychiatric Center in Delaware as well as Mayo Medical School of Graduate Education in Minnesota. In addition to S'eclairer, Dr. Jahangeer is currently the Director of Mental Health at Highlands Hospital in Connellsville, PA, and a Consulting Psychiatrist for Adelphoi Village Inc. and Excela Health System in Westmoreland County, PA. His interests include Attention Deficit Hyperactivity Disorder, Autism Spectrum Disorders, Mood Disorders, Eating Disorders, Post Traumatic Stress Disorder, and Child Development. Dr. Chaudhary has been a resident of Western PA for the past 20 years. Following her completion of Medical School, she practiced in the field of Obstetrics and Gynecology and received training in psychiatry from Allegheny General Hospital in Pittsburgh, PA to further her knowledge in behavioral health. She has been trained in mindfulness-based stress reduction, a training led by a world renowned Mindfulness expert, Dr. Jon Kabat Zin, PhD. She has received intensive training in Dialectical Behavioral Therapy, which she applies in her clinical teaching, educational initiatives, retreats and seminars. She is the founder of Z'Harmony. Z'Harmony is a place for everyone, with a mission to heal the heart, mind, body, and the beautiful earth we all enjoy. Her interests include writing, traveling, teaching, and organizing creative models of healthy-living. At present, she is a clinical assistant professor at LECOM Medical College at Seton Hill University. Sasha is a Physician Assistant that joined S'eclairer in 2014. Sasha graduated from the physician assistant program at the University of Mount Union in Alliance, OH. Sasha had prior interest in the science of psychiatry and mindfulness practices, so when she rotated at Seclairer, while in school, she felt an affinity with the practice. She is now happy to be a part of the team. Sasha is also an avid equestrian and would love to incorporate her passion for horses into an equine assisted psychotherapy program at S'eclairer. Sasha's masters thesis was on this type of therapy and she is hopeful that S'eclairer would be a wonderful place to utilize this adjunctive treatment option. In addition to riding horses, Sasha also enjoys reading, spending time outdoors, traveling, and being with family and friends. Chelsey is a Physician Assistant who had been working as a Hospitalist, deeply involved in medicine, when she became re-inspired by her true passion: the power of the mind and using exercise as medicine. Chelsey graduated from Slippery Rock University with a Bachelor’s degree in Exercise Science. From there, she taught a multitude of group fitness classes as well as worked one-on-one with clients in an effort to overcome their barriers and find enjoyment in movement while feeling overall healthier in mind, body, and soul. She decided to challenge herself and stimulate her mind further with the intricacy of medicine, so she decided to go back to graduate school at Philadelphia College of Osteopathic Medicine for a Master’s degree as a Physician Assistant. Now, she is eager to begin as a Psychiatric PA at S’eclairer to incorporate both of her backgrounds in exercise as well as medicine to give a well-rounded approach in care for mental health. In Chelsey’s free time, she enjoys yoga, painting, trail running and kayaking. Sandi is a Licensed Practical Nurse. ​Meditation Hiking Group at S’eclairer. Chrissy is a professional drug & alcohol and mental health counselor. She completed her education at Slippery Rock University where she received a Bachelor of Science degree in Psychology and Social work. She has worked in various Intensive Outpatient Mental Health and Substance Abuse Programs over the past 15 years. She also has extensive experience in Methadone Maintenance Treatment and Suboxone Maintenance Treatment. Chrissy is presently consulting at S'eclairer where she specializes in Individual, family and Group therapy. She has been trained and practices Dialectical Behavioral Therapy, Motivational Interviewing, Cognitive Behavioral Therapy and Reality Therapy. She enjoys exploring new ideas and challenges ineffective patterns of behaviors. Her interests include spending quality time with her husband and three daughters, socializing with friends, golfing, and exercise. Tim has worked as a TSS and Transitional aide for the past eight years. Having a son on the spectrum changed his life in many ways and has positively influenced the work that he does. Hayley is a National Certified Counselor, and is currently working on a part-time basis offering individual therapy. She graduated from Indiana University of Pennsylvania with undergraduate degrees in Psychology and Cultural Anthropology and master's degrees in Employment and Labor Relations and Clinical Mental Health Counseling. She has experience working with adults facing depression, anxiety, stress and life changes/transitions. She believes in a holistic therapeutic approach and often incorporates a variety of techniques and perspectives into sessions for individualized client care. Her therapeutic goals are to provide a genuine and validating environment where one can open up without judgement. Her interests include landscape photography, being outdoors hiking or fishing, traveling, baking, and spending time with family. Alexandra S. Molnar, M.S.C.P., N.C.C. Lex is a Nationally Certified Counselor who holds a Bachelor’s Degree in Psychology from Duquesne University and a Master’s Degree in Counseling Psychology from Chatham University. She completed an internship at S’eclairer while doing her graduate work and is excited to be a part of the team. Lex has a strong interest in marriage and family therapy, trauma therapy, and anxiety and depression therapy. She also has an strong interest in animal assisted therapy, including but not limited to, the use of horses and dogs in a therapeutic setting. In her spare time, she enjoys reading and hanging out with friends and family. She is also an avid equestrian, riding both for pleasure and in various local competitions. ​Using a mindfulness-based cognitive approach, I help people deal with self-concept, self-esteem, identity formation and develop the ability to make conscious choices. I deal with bipolar disorder, borderline personality disorder, anxiety, and depression. I have been successful with my own full impact mindfulness technique in dealing with disassociation and psychosis, PTSD and trauma. Mindfulness based cognitive behavioral therapy is a way to "step back and become the observer behind the thinker." I do not teach though blocking or suppression however challenge individuals to challenge thought, feelings and their "disregulated thinker." I am in long term recovery from drug and alcohol addiction and am actively engaged in 12 step recovery and have had my own "time of troubles" which give me a unique perspective. I treat "people not diagnosis" and use a holistic mind, body and spirit approach to wellness. 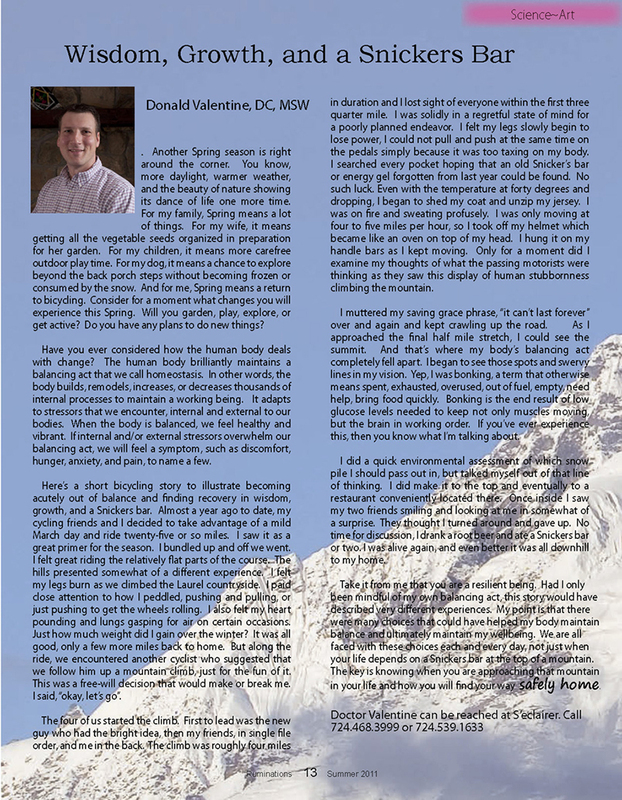 The adjunctive faculty shares in the mission and vision of S’eclairer’s Integrative Psychiatric Practice. They have participated in our retreats, seminars, and clinical education. Dr. Ted J. Cibik is a licensed Doctor of Medical QiGong (Energy Medicine / Energy Psychology) and he is registered with the Ministry of Health in Beijing, China. He has lectured frequently to the U.S. Government (including the National Institutes of Health), the private sector, and academia. He was awarded the title of Zhong Yi or Doctor of Chinese Medicine / Taoist Priest - an 89th generation disciple of Jade Purity Sect after 12 years of study. He is a Level IV QiGong Teacher and Advanced Clinical Therapist in Medical QiGong from the NQA (The NQA’s highest level of certification in North America). Dr. Cibik is the founder of Formless Taoism, a sect rooted in ancient shamanic energy practices dedicated to understanding the wisdom of Mind, Heart, and Body (while incorporating) 21st century science. Dr. Cibik’s two-year course in Formless Taoism is a spiritual development program to obtain peace of mind when surrounded by chaos – leading to enlightenment. Dr. Cibik’s three-year Medical QiGong course is meant to train energy professionals to use Medical QiGong concepts to minimize suffering in the world. Dr. Valentine has been in practice for over a decade in Western Pennsylvania. 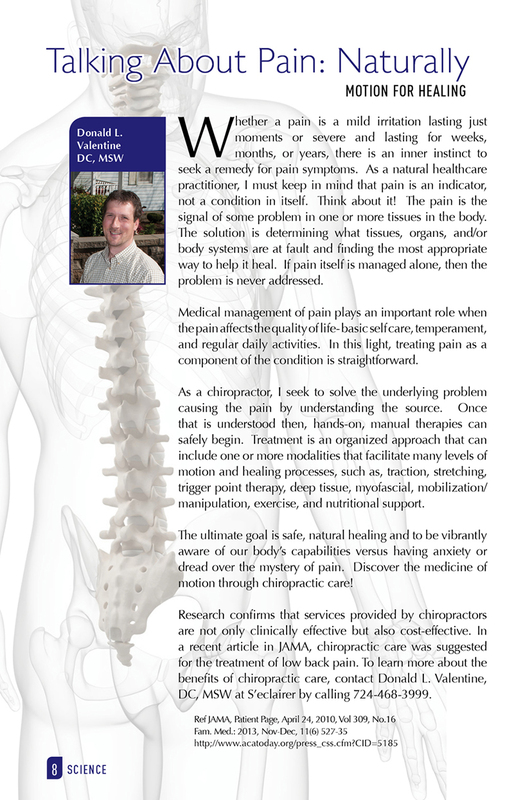 He is a graduate of Palmer College of Chiropractic and is board-certified. His practice offers a wide variety of chiropractic techniques. Dr. Valentine utilizes Full Spine Diversified, Gonstead, Sacro-Occipital, Koren Specific and instrument adjusting techniques- a spectrum of techniques from deep/heavy to light/gentle in application, depending on patient preference. Dr. Valentine looks forward to meeting you and helping your body work at its best so you may lead a full, enjoyable, and balanced lifestyle. Get the quality care and pain relief you desire- call today! Dr. Valentine can be reached by calling (724)- 539-1633 or (724) 468-3999. Dr. Valentine has a doctoral degree in pastoral psychology and is a board certified psychiatric clinical nurse specialist. She specializes in an integrative approach to counseling that includes the psychological, physical, and spiritual dimensions of life. She designs and coordinates retreats and educational seminars that promote integrative healthy life styles. Also, she is the founder of the Health & Wellness Association that includes professional providers and recipients of integrative health care. "The Pain of Childbirth and Mindfulness: A Nurse's Perspective"
"The Value of a Retreat"
​James provides music as support for many occasions at S’eclairer including process groups and special retreat events. He has applied music wellness programs in hospitals, nursing homes and schools as well. He also produces video and print material and all other media tasks such as the website and social media. ​"Giving Up to Give Back"